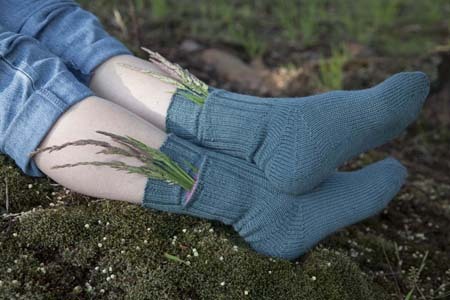 These practical, playful socks are the second design in my eBook, Cat’s Sweet Tomato Heel Socks. To purchase the entire eBook for $20 (read below for more information), click here. Or, if you prefer to buy just this single sock pattern for $6, click here. You will have the choice of paying by Paypal or by credit card. The socks come in all sizes from children to large men, and can hold small treasures or your essentials. The hidden pockets use the easy insertion method from my 2009 book, Personal Footprints for Insouciant Sock Knitters, and may be worked with leftover yarn. If you make all four pockets, you can actually fit a cell phone, credit cards, and cash in your socks, and won’t need to carry a purse. The sock features my Sweet Tomato Heel, which emerged last winter after several days of sitting beside the wood stove with my mother while trying to fiddle my way towards a new short-row heel. I’d given up several times when almost unconsciously, I did a small thing—and just like that, the clean heel of my dreams existed. This small thing closes gaps without holes, wraps, or acrobatics. The heel is rhythmic to work and nearly perfectly smooth, like a tomato. Best of all, once the process is understood, a knitter needs no written instructions. With the pockets turned inside out, you get a puppy-dog effect.